Newly streamlined for the 2013/14 season, the Broad Peak 28 backpack could be the perfect companion for day tours. 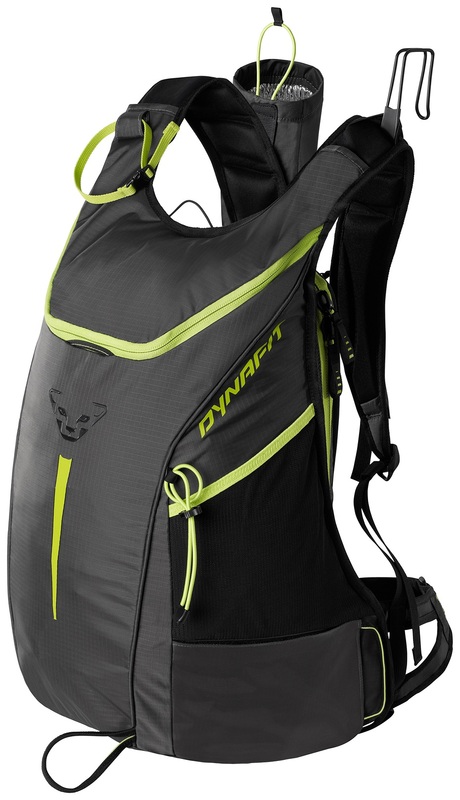 Described as the "big brother" of Dynafit's race pack, the RC 20, the BP has eight more liters of internal volume and a slew of extra features. Dynafit also took pride in the importance of placing the helmet on the pack, helpful for those who like to maximize cranial air flow during ascents. The rip stop nylon shell is designed to last for many seasons of everyday use at a much lighter 694 grams (1 pound 8.5 ounces). Like all the packs we carry, the Broad Peak features the ability to take your skis on and off without removing the pack, a huge time saver. Diagonal ski carry system has a unique adjustable lower loop that fits tails up to about 150mm wide. Helmet case accessible from the top of the pack is elastic lined to make for quick and secure storage. Built-in polytetrafluoroethylene (PTFE) membrane is hydrophobic to keep your gear dry. Special internal compartments are designed to secure your avy shovel and probe. Removable water bottle holder (29g) on the shoulder strap is insulated and lined with a thermal reflector. Simple ice axe system with a lower fixed loop and adjustable elastic cord holds picks up to ~70cm. Full length compartment zip on the back makes it easy to access much of the 28 liters of internal volume. Mesh stash pockets on the sides are a great place for thin layers, skins, or whatever else you decide. Velcro side access safety box with removable divider (97g) is a great place to store crampons, layers, or an extra water bottle. Breatheable shoulder straps have staggered padding to keep you cool and comfortable. Removable lightweight frame (72g) in the back compartment helps support bigger loads if necessary. Usage Light and fast ski mountaineering. Notes Specially designed elastic helmet compartment. Bottom Line Excellent ski touring rucksack. I wound up getting one of these over the off-season to replace my jerry-rigged race ski carry on a BD Bandit pack. The weight savings is significant, while not being too much heavier than the tiny, race-only RC 20. I fret less about weight on my back than weight on my feet, within reason. The compartments are a little unintuitive, and the zippers can be fickle. That aside, the light weight and easy race-ready diagonal ski carry, plus easy-access crampon pocket have me excited for the upcoming ski season. Seems worth consideration over the RC 20 if you want a little more space for inbounds touring. I'll add to this review as the race season unfolds. Hey Tim, looks like that would be a big fat 'no' for Santa. Now showing as shipping from Dynafit next week. Overall: Five Stars for an excellent smaller-capacity ski mountaineering pack that it also light enough for skimo racing. Background on product familiarity: I’ve put the original version through all sorts of abuse. I’ve also compared/contrasted my pack with the more streamlined version that came out in Fall 2013. First, the first impressions out of the box: The capacity is skimpy from the viewpoint of midwinter insulation layers and/or large avy rescue gear. However, for warmer temperatures and/or more compact gear, the capacity is definitely adequate. And the weight:capacity ratio is excellent, along with the ability to carry more technical gear on the outside. The side-accessed lower compartment is super convenient, and a strap-mounted bottle carrier is included (as well as removable if you don’t like it). Plus of course a quick-attach ski carry system. Second impressions, in use: Everything works very well as designed. Pretty much the only caveat is that the shoulder straps can get confusingly twisted up sometimes when putting the pack back on, but you hardly ever need to take the pack on and off. And I’m surprised that the current version has eliminated the side-compression straps, although maybe these aren’t necessary on such a compact pack. I have the same hook-style quick attachment ski carrying systems on my equally abused Manaslu packs (and previously had it on my RC 20 pack), so probably hundreds (thousands?) of deployments by now. If you’re in a rush and on mellow terrain, then just insert the tails and clip the skis to be done. If you can spare another second yet can’t risk the slim chance of losing your skis, then wrap the stretchy material halfway around the skis before clipping for an attachment that will stay secure even when the “fragile alpine vegetation” seeks revenge on you during painful off-snow portages. I have the same bottle holder on my Manaslu pack (and previously had it on my RC 20 pack). Perfect for carrying a small Nalgene bottle in cold temperatures that might freeze a hydration bladder hose. And perfect for carrying a hybrid bottle with hydration hose (ironically available in North America only from Dynafit’s rival CAMP) for easy refills from natural water sources on long spring and summer tours. In between those two extremes, I prefer a hydration system, but the Dynafit bottle holder is easily removable. Third impressions, for long-term durability: My older version has held up very well, although the newer version has different fabric. The velcro on the side-accessed lower compartment might seem suspect, but the same design is still going strong on both my Broad Peak and Manaslu packs. Hi there, nice review, is the hook-style quick attachment ski carrying system removable for summer use for example ? Alexandre, the hook (and elastic strap) are not removable. But it tucks out of the way nicely into a little sleeve (*unlike* as shown in the picture), and even with that superfluous ounce or so, it's still a very light pack for any sort of summer use. What is 4 + 13?